The Most Exciting Thing To Ever Come Out of My Oven | Keep It Up, David! It’s gorgeous. I don’t see these very often, and I do love my oddly-colored vegetables. 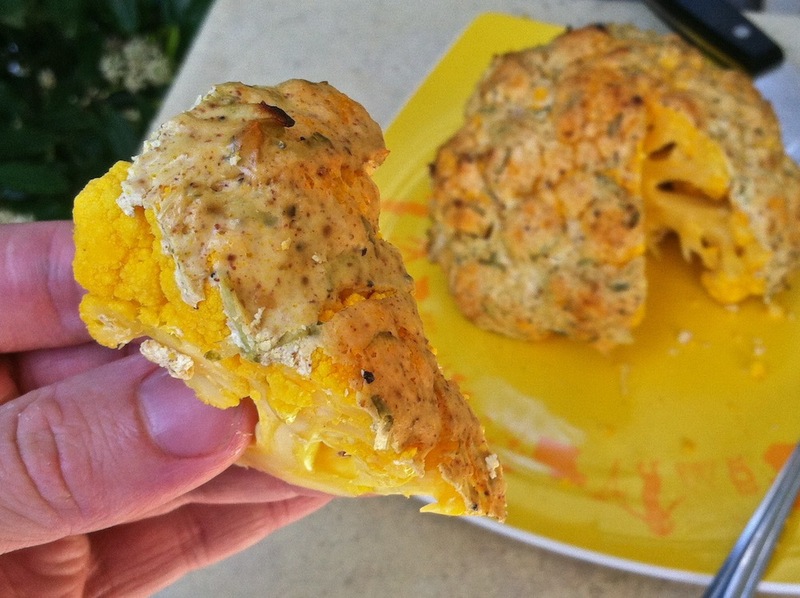 I went through a phase a few years ago when I was actively seeking out all sorts of oddly-colored veggies (including orange cauliflower) and it made for some good blog posts and even better eating. In case you’re wondering, an orange cauliflower isn’t genetically modified, it’s a hybrid that’s the result of meticulous cross-breeding. 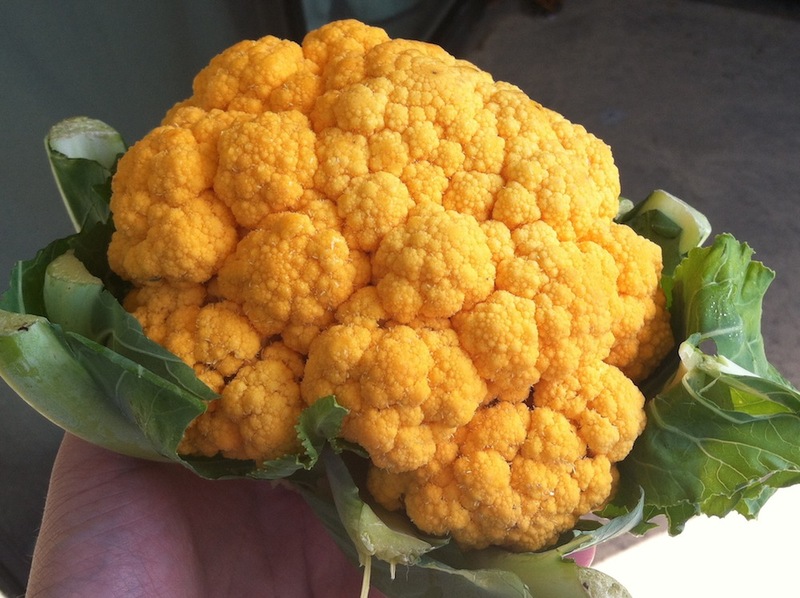 And it has 25 times the vitamin A that regular cauliflower has, so there’s that, too! With my excitement levels already rising, the question then became… what was I going to do with it? 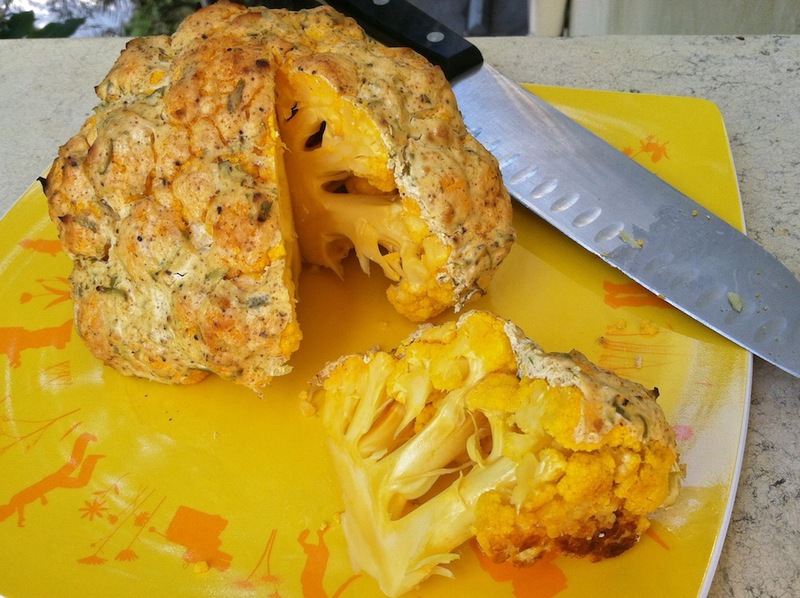 I was perusing the interwebs, looking for inspiration, when I came across a post that posited a completely foreign idea: that you can roast a cauliflower WHOLE. Hold. The. Phones. Roasting cauliflower florets is nothing new, but roasting the whole freakin’ thing? This I gotta try! My excitement levels shot a hole through the roof. I suggest a shallow, wide bowl because once you trim the leaves and base of the stem from the cauliflower, you can dunk the whole thing in upside-down. 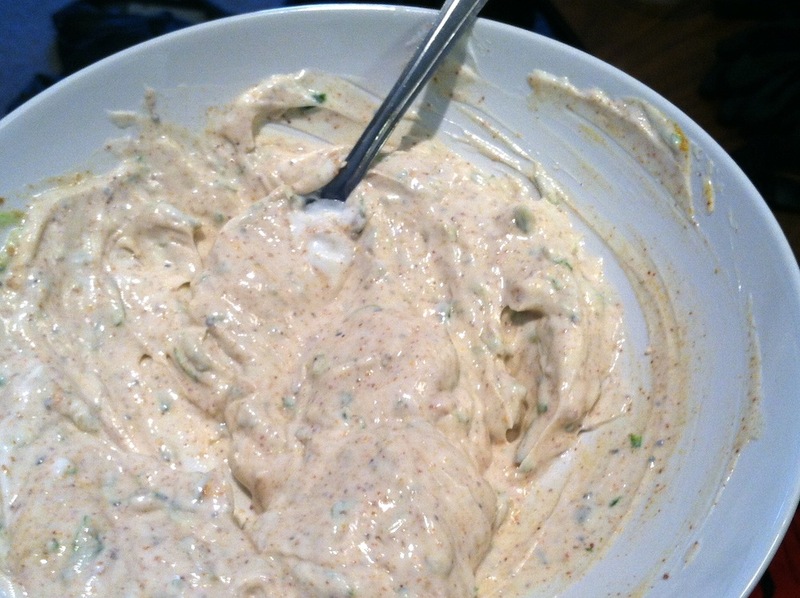 Then, with a spatula or brush (or be like me and use your fingers), smear the marinade over the rest of the exterior. Place it on a baking sheet that you’ve spritzed with a little Pam. Kinda reminds you of Baked Alaska, no? 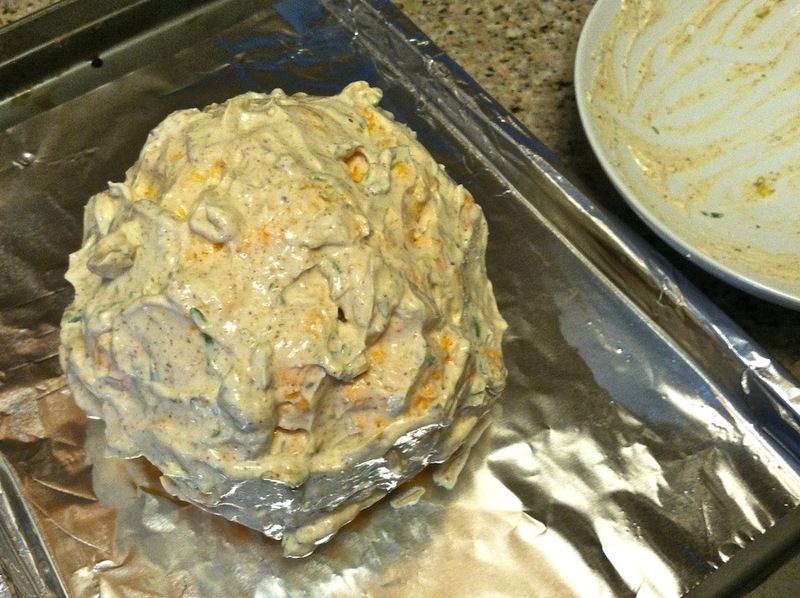 Then it goes into a 400-degree oven for about 40 minutes, or until the marinade is golden brown. I can’t even describe how happy and excited I was when I heard the timer go off and it was time to remove this from the oven. Seriously. It was the most exciting thing I’ve ever pulled out of my oven. Ever! Take a look! It’s mesmerizing. I could look at it for hours. I want to shellac it and keep it as the centerpiece on my table. I want to dress up like it for Halloween. More immediately, I wanted to inhale it right then and there, but I waited a few minutes so it could cool a little bit. Then, I sliced it like a cake. The cauliflower on the inside is tender and fully cooked, and the marinade dried out in the oven, forming a intense, flavorful crust. 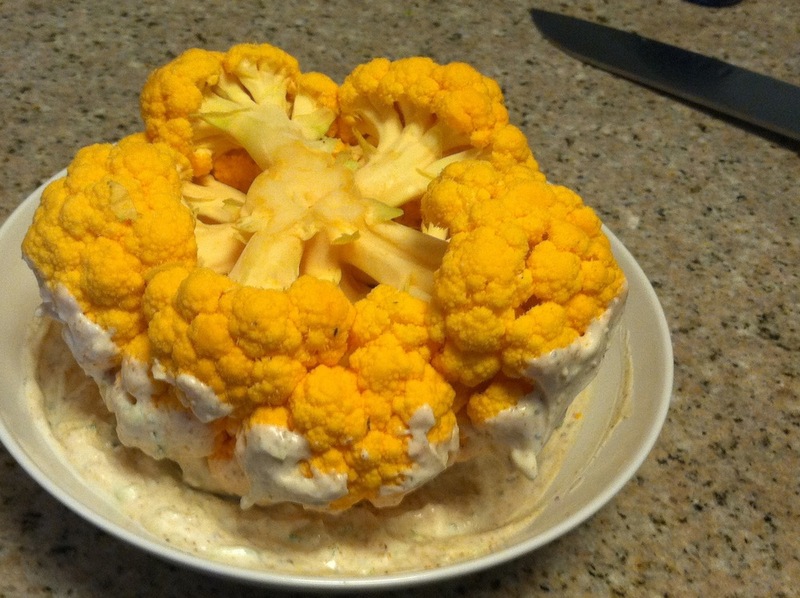 It was the best cauliflower I’ve ever eaten, and by far the most awesome presentation. I can’t wait to do this again! What a fun idea for a dinner party! I wonder what else I could add to the marinade to switch up the flavors. Do you have any ideas? Share them in the Comments section! And do I need to mention how healthy this dish is? Cauliflower, nonfat yogurt, lime, and spices. That’s it. I already mentioned that orange cauliflower is loaded with vitamin A, but even regular cauliflower is a nutritional powerhouse. It has lots of antioxidants, is high in vitamin C, the B vitamins, and fiber, and even has some omega-3 fatty acids. So tuck in and enjoy! 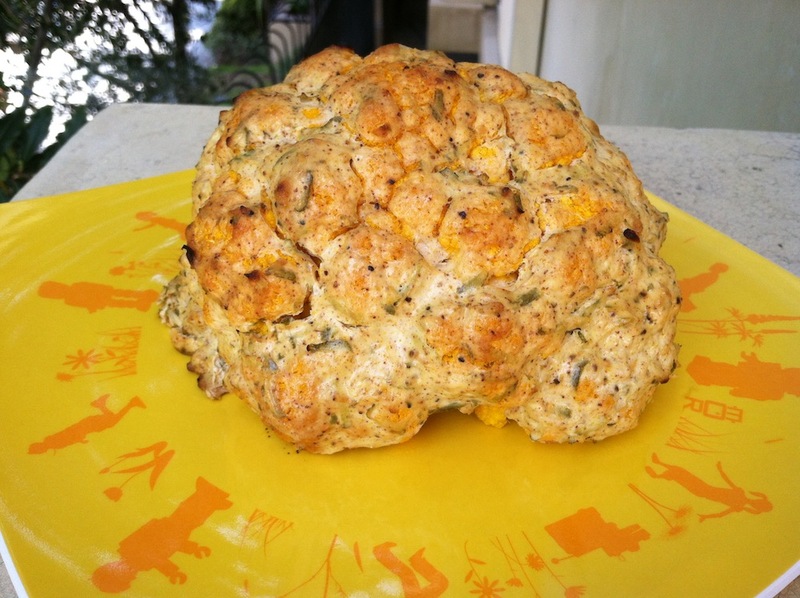 Vegetable Week concludes tomorrow with another cauliflower dish, and hold on to your hats, because the cauliflower ain’t your regular cauliflower! Read my other recent veggie posts here and here, and check out ALL my recipes here. This entry was posted on Wednesday, March 26th, 2014 at 12:01 am and is filed under Uncategorized. You can follow any responses to this entry through the RSS 2.0 feed. You can leave a response, or trackback from your own site. That does look delicious! I’d like a piece right now please! How about some cayenne pepper or red pepper flakes to really spice it up?! Yummy. Thanks for sharing. This looks amazing! Definitely trying it. That looks wonderful. I do have a question though. Do you only eat vegetables most of the time? I mean did you only eat the whole head of cauliflower for a meal? I didn’t eat that cauliflower all at once, I spread it out between a few meals and snacks. I do eat lots of other foods, but lately I’ve been focused on trying new things with veggies, so that’s the stuff I blog about. In tomorrow’s post you’ll see how veggies play a whole in an entire meal, so look out for that! Wow this looks delicious and I really am not a fan of cauliflower. I’m also not a fan of brussel sprouts but all the recipes look so good I now have to try them! THIS. LOOKS. AMAZING. I know what I’m doing with my Tonight! This looks and sounds amazing. Cauliflower often reminds me of how the human brain appears, which is quite fitting since cauliflower is also a potent brain food. It’s fairly high in citicoline, which can help boost mental energy and efficacy…. I’m all for mental energy and efficacy! Peanuts are another good source for citicoline.